Above Photo: Rick Bowmer, The Associated Press. Supporters of the Bears Ears and Grand Staircase-Escalante National Monuments gather during a rally Saturday, Dec. 2, 2017, in Salt Lake City. President Donald Trump is expected to announce plans to shrink the two sprawling national monuments in Utah that were created by past Democratic presidents. SALT LAKE CITY — Thousands of protesters fired up by President Donald Trump’s expected announcement to shrink two national monuments in Utah rallied in Salt Lake City on Saturday, just two days ahead of his planned visit. Crowds converged on the steps of the Utah State Capitol to denounce Trump’s decision, many chanting and holding signs with messages such as “Protect Wild Utah.” Native American groups, some in tribal dress, danced or formed drum circles. Speakers who addressed the throngs of demonstrators included a state lawmaker and an official with the Navajo Nation. Supporters of the Bears Ears and Grand Staircase-Escalante National Monuments gather during a rally Saturday, Dec. 2, 2017, in Salt Lake City. President Donald Trump is expected to announce plans next week to shrink the two sprawling Utah national monuments by reversing actions taken by former President Barack Obama. State Rep. Patrice Arent, a Democrat from Millcreek, accused Trump of coming to “wreak destruction on a land he knows basically nothing about,” the Salt Lake Tribune reported . Navajo Nation Attorney General Ethel Branch vowed said the president should see these monuments for himself. “I want him to visit Bears Ears before he takes any action,” Branch said. 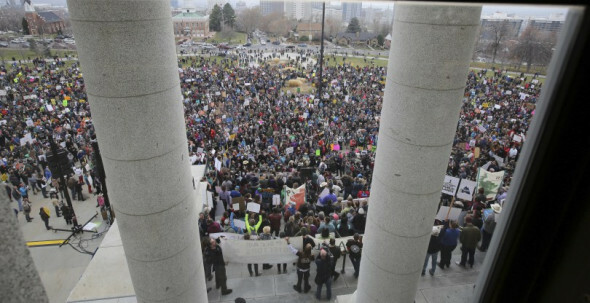 Roughly 5,000 people showed up to the rally, according to the Utah Highway Patrol. The demonstration remained relatively peaceful. Trump is scheduled to visit the state on Monday, when he will announce a plan to reduce the size of Bears Ears and Staircase-Escalante National Monuments by nearly two-thirds. Those monuments were designated by former presidents Barack Obama and Bill Clinton, respectively. Trump’s move would be the first such act by a president in half a century. Environmentalists and tribal leaders have decried the decision as illegal and an affront to Native Americans. Leaked documents obtained by The Associated Press show that Trump plans to shrink Bears Ears National Monument by nearly 85 percent and reduce Grand Staircase-Escalante National Monument by almost half. The plan would cut the total amount of land in the state’s red rock country protected under monument status from more than 3.2 million acres (5,000 square miles) to about 1.2 million acres (1,875 square miles). Trump has told Republican Sen. Orrin Hatch and other Utah officials that he will follow the recommendation of Interior Secretary Ryan Zinke to shrink both monuments.